Whether it’s his repertoire from the mid-1950s or the “sheets of sound” music of the late 1950s onwards or the “spiritual explorations” of 1962 until his passing, with John Coltrane it’s always prudent to expect the unexpected. Compassion-The Music of John Coltranedoesn’t disappoint, as Dave Liebman and Joe Lovano with Phil Markowitz, Ron McClure and Billy Hart bring theatrical flair to this Coltrane music. Here, in all its radiant apparel, is the splendour of Jazz’s golden age. Whether it is in the balletic grace of “Central Park West/Dear Lord” or “Equinox”, or in the elaborate marvels of “Reverend King” and “Compassion” or the bluesy “Locomotion” and the fascinating journey of “Olé”, the tenor saxophone duo of Liebman and Lovano offer fascinating insights into the music of John Coltrane. 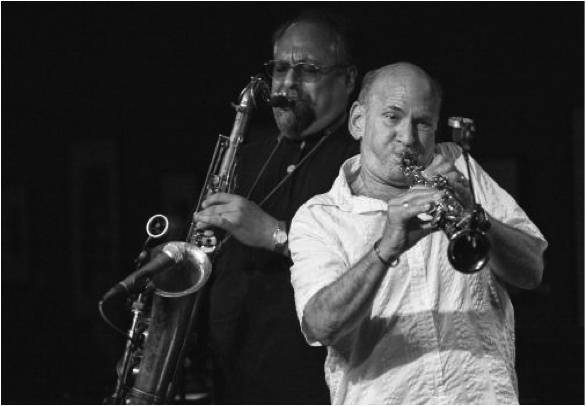 Indeed all of the musicians, especially Dave Liebman and Joe Lovano are on top form. The saxophonists make light of the technical challenges of Coltrane’s early, middle and late period work; Dave Liebman in the stirring fervour of his playing on tenor, his soaring flights on recorder and flute and by the sheer humanness of his presence and Joe Lovano with characteristically quiet and guarded warmth – and without over-blown out-breaths – particularly in “Compassion”. With sterling contributions by drummer Billy Hart – especially in the opening moments of “Compassion” – as well as from bassist Ron McClure and pianist Phil Markowitz, all of whom keep that piece from “A Love Supreme” together while the saxophonists handle its breaking flow with appropriate freedom. The music was recorded a decade ago for BBC Radio 3’s Jazz on 3 where the music of John Coltrane was being celebrated as it entered its 40th year. It’s hard not to enjoy this music, not only because it is the music of Coltrane, one of greatest musicians who ever lived, but also because it is so exquisitely played especially as stirring in soli ricochet through the full-blooded ensemble unfolding of Coltrane’s pieces, and in the music’s first-rate recording by John Fishnell. This is music to be enjoyed wide-eyed or – better still – with eyes tightly shut as one is sucked into the vortex of John Coltrane’s music. Either way it is music to die for – not surprisingly from Resonance Records.